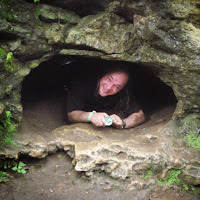 Have you ever played one of those claw games in an arcade or store, where you try to get the claw to grab a stuffed animal or silly toy and drop it down a chute? I had a friend that was uncannily good at those games. He had a whole shelf full of the stuff he won from those claw games. Whenever I played though, the claw would grab the prize I wanted, only to slide right off it, like a Chicago Bears wide receiver trying to catch an end zone pass. Well, in Greedy Claw you'll have a much better chance of getting prizes, but can you get more than your opponents? It'll take some skill and a fair amount of luck to collect the most valuable toys. Greedy Claw Crane Game is for two to five players and takes about 20-30 minutes. 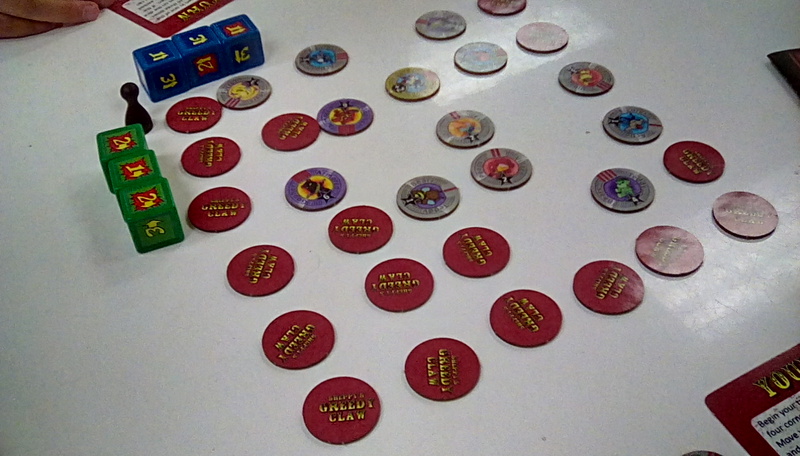 It's a very casual dice and token game that is suitable as a filler or family game. It should be on Kickstarter soon. tokens and I'm not sure if the white mini poker chips will be included or not. In Greedy Claw players will use dice to control either the movement or gripping strength of the claw as it moves around a grid of prizes. To set up the game you'll first create a 6x6 grid of tokens. The tokens are stacked face-up, with the inner 4x4 square having three in a stack and the central 2x2 square having four in a stack. Then a pawn is placed in a random location in the grid, determined by starting the pawn in a corner and rolling two dice, one for vertical moves and one for horizontal. You'll move the claw pawn around the grid of prizes, trying to pick up the most valuable ones. There are several types of tokens, representing prizes in the claw machine, each from one of seven groups, or families. Most prizes are common prizes that are worth anywhere from one to four points. Some rare prizes give you a bonus of two points for any basic prize in the same family. Others double the value of any one prize. Each player will get assigned a random group that they'll get a bonus point for each token in that family they collect. But be careful if you press your luck too much. There are also some bad prizes (like the broken bottle) that will give you negative points if you wind up picking them up. goal family is worth a bonus point. On your turn you'll try to collect one or more prizes. Usually you'll just go for one prize token, but sometimes you'll want to push your luck and try to "Wing It" and go for multiple tokens. If you grab a token with little wings on it you'll get to take another turn. But there's a catch. Two, actually. First, if you fail to pick up another token you'll drop the "Wing It" token and won't get anything. Second, on your extra turn you don't get to use any of the dice you used as grips to pick up the prior token. So your available pool of dice dwindles as you try to grab more tokens. If you grab that Wing It bear first you can then take an additional turn to go for another token. This might be a good point to explain exactly how you try to collect prizes. You'll start your turn by rolling the six dice. 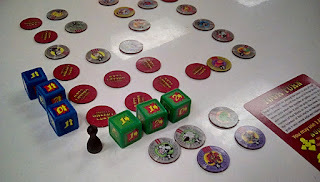 Each die has a combination of numbers for movement and bursts for grips. You'll get to decide for each die if it should be used to move the claw pawn or to grab a prize. If you use the die for movement, place it on the token where you the claw pawn is at and then move the pawn in a straight line the number of spaces indicated on the die. To use a die for grips, set the die aside. You have to use at least two dice before you reroll any unused dice. Then you have to use at least two more dice before a final reroll. At the end of your turn you have to use all your dice for either movement or grips. If you have grips at least equal to the grips required to pick up the token the claw pawn is on you can collect that token. If you ever empty a stack of tokens the surrounding toys will fall into the vacated space, a nice thematic element, although it adds to the fiddlyness of the game a bit. Here I moved to the right two, up two, and right one, then spent six grips to pick up that Wing It token. If I want to I can use those three dice used for movement to try for another token, but if I can't pick up another I'll lose them both. If you picked up a "Wing It" token you can try for another token, as described above. Otherwise pass the dice to the next player. Players take turns until someone has collected tokens of a specific value, depending on the number of players, and then the current round is finished. Players tally up their scores, including bonuses from rare prizes and their personal goal. The winner is the player with the most points! Greedy Claw Crane Game is a light filler game. You won't find a whole lot of strategy here, beyond the obvious maximizing points each turn. The dice also add a lot of chance and randomness to the game. But Greedy Claw does a pretty good job for what it's intended for. It's light, easy to learn, good for the family, and a fun theme. When I first received the prototype of Greedy Claw I played it and was very unimpressed. It was fiddly, super random, and not much fun. But I had several months before I had to get a review out, so it sat on my shelf for a while. In the meantime the designer sent me two updates to the game, one was pretty significant, replacing nearly all the components! But it was worth it. The resulting game is worlds better than where it was in September. This is a fast, fun game that is great for families! That said, I do still have a few issues with Greedy Claw, however I don't think any of them are deal breakers and some I already know are going to be fixed in the production copy. The biggest issue with the game is the size of the tokens. 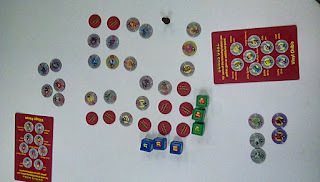 The 1" circles are very small, making them difficult to stack, the information on them very difficult to read, and the dice challenging to place on top of the stacks. The artwork is also very busy, partly because everything is so small, and partly because of the starburst backgrounds. The good news is that the plan is to increase the size of the tokens significantly, hopefully to 1.5". This will allow for much larger artwork (which is good because the toys are adorable) and better readability of the icons. I'm not sure if the busy background will still be an issue on the larger tokens, but hopefully that's something the designer takes into consideration. The small tokens are hard to see across the table, but much larger tokens should be in the final game. Another fairly major issue is the downtime between turns. The two player game moved very quickly, however the four player game dragged quite a bit. Since the main strategy in the game is in trying to figure out how to maximize your points each turn analysis paralysis can be fairly significant. You can't really plan ahead because the playing area is constantly changing and you have no idea what you're going to roll on the dice, so each turn requires evaluating all your options every time. This isn't necessarily a reason to avoid the game completely, but something to be aware of when playing with certain players (you know who I'm talking about). There were also a few areas of the rules that could use a bit of clarification, but nothing major. It's not specifically stated that you have to use all of your dice every turn, although that becomes obvious from the gameplay. "Winging It" is probably the most complex concept in the game. We actually played that part slightly wrong at first. We didn't realize that you had to use all of your dice to get the "Wing It" token and then start over completely with all the dice, minus the ones used for Grip. Instead we played that you could move, pick up a "Wing It" token with some Grips, and then continue with your remaining dice, trying to get another token. The way we played eliminated some of the push-your-luck aspect of the game, but also made turns go a little faster since you weren't taking another full turn. We also didn't play with the cascading prizes, instead using white mini poker chips to fill in empty spaces, but that was mainly because that was how the rules were in an earlier version of the game and I didn't notice the part about the cascading toys at first. 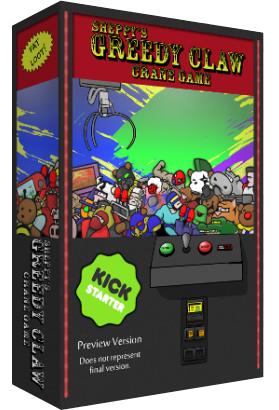 Overall, I think Greedy Claw Crane Game is a very solid filler. It'll be fun for families or casual game nights, as long as the players keep the pace swift. If this sounds like a game you'd be interested in, be sure to check it out when it hits Kickstarter in February. 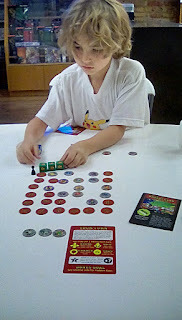 Great theme, fast play, and easy to learn rules make this a great filler or family game. Below here are a few pictures of the very old version that I played in September. This new version is much better for its updates! GJJG Game Reviews are independent, unpaid reviews of games I, George Jaros, have played with my family and friends. Some of these games I own, some are owned by friends, some are borrowed, and some are print and play versions of games. Where applicable I will indicate if games have been played with kids or adults or a mix (Family Play). I won't go into extensive detail about how to play the game (there are plenty of other sources for that information and I'll occasionally link to those other sources), but I will give my impressions of the game and how my friends and family reacted to the game. Quick Reviews will only get a single rating of 1-10 (low-high) based on my first impressions of the game during my first few times playing. Hopefully I'll get more chances to play the game and will be able to give it a full review soon.